"I have the fondest memories of Cleda. Sorry for your loss...."
"Long time Columbia View Garden Club members always tell the..."
On August 19, 2015, at age 104+, Cleda Marie Croft Stevens Abourezk passed away in Vancouver, WA. She was born in Eugene, OR and spent most of her life in the Portland, OR/Vancouver, WA area. She worked as a Secretary/Administrative Assistant. Cleda lived a full and active life. She travelled around the world and especially enjoyed trips to Hawaii and Mexico. She enjoyed playing golf at Royal Oaks Country Club, finally retiring her clubs at age 98. She was the proud holder of four Holes in One. 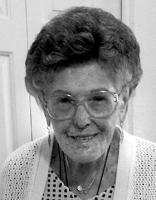 Bridge was her favorite card game, although she was an awesome gin rummy and cribbage player. A very creative person, Cleda loved painting, weaving and writing. She was a member of Good Shepherd Episcopal Church, P.E.O. Chapter EV, Columbia View Garden Club and Laura Kendall Seattle Children's Hospital Guild. Cleda leaves behind her three daughters: Sue Stevens of Tacoma, Sally Bjerklie (Jim) of Snohomish and Sarann Benson (David) of Portland; 5 Grandchildren; 8 Great-Grandchildren; and 1 Great-Great-Grandson. She was preceded in death by her husband, Joe Abourezk. A memorial service for Cleda will be held on Mon., Sept. 14th at 1:00 p.m. at Good Shepherd Episcopal Church, 805 SE Ellsworth Rd., Vancouver, WA 98664. Reception to follow at Royal Oaks Country Club. In lieu of flowers, memorials in Cleda's honor can be made to Good Shepherd Episcopal Church, The Salvation Army or Fight for the Cure.